The so-called “Arab Spring” continues to transition into a “Christian Winter,” including in those nations undergoing democratic change, such as Egypt, where the Muslim Brotherhood and the Salafis dominated the elections—unsurprisingly so, considering the Obama administration has actually been training Islamists for elections. Arab regimes not overthrown by the “Arab Spring” are under mounting international pressure; these include the secular Assad regime of Syria, where Christians, who comprise some 10% of the population, are fearful of the future, having seen the effects of democracy in neighboring nations such as Iraq, where, since the fall of the Saddam regime, Christians have been all but decimated. Categorized by theme, November’s batch of Muslim persecution of Christians around the world includes (but is not limited to) the following accounts, listed according to theme and in alphabetical order by country, not necessarily severity. Iran: The nation’s minister of intelligence said that house churches in his country are a threat to Iranian youth, and acknowledged a new series of efforts to fight the growth of the house church movement in Iran. Nigeria: Islamic militants shouting “Allahu Akbar” carried out coordinated attacks on churches and police stations, including opening fire on a congregation of “mostly women and children,” killing dozens. The attacks occurred in a region where hundreds of people were earlier killed during violence that erupted after President Jonathan, a Christian, beat his closet Muslim rival in April elections. Turkey: The ancient Aghia Sophia church has been turned into a mosque. Playing an important role in ecumenical history, the church was first transformed into a mosque in 1331 by the jihadist Ottoman state. As a sign of secularization, however, in 1920 it was turned into a museum. Its transformation again into a mosque is a reflection of Turkey’s re-Islamization. Afghanis around the world are being threatened for leaving Islam and converting to Christianity. One exile, who changed his name after fleeing Afghanistan in 2007 when an Islamic court issued an arrest warrant for his conversion, is still receiving threats: “They [Afghan officials] were very angry and saying that they will hit me by knife and kill me.” Even in distant Norway last September, an Afghan convert to Christianity was scalded with boiling water and acid at a refugee processing center: “If you do not return to Islam, we will kill you,” his attackers told him. Iran: Pastor Yousef Nadarkhani, who caught the attention of the world after being imprisoned and awaiting execution for leaving Islam, remains behind bars as officials continue to come up with excuses to force him to renounce Christianity, the latest being that “everyone is [born]a Muslim.” A Christian couple “who had been snatched and illegally-detained” by authorities for eight months without any formal charges, were finally released, beaten again, and have since fled the country. While imprisoned, they were “ridiculed and debased” for their Christian faith. Egypt: After a Christian inadvertently killed a Muslim in a quarrel begun by the latter, thousands of Muslims rose in violence, “collectively punishing” the Copts of the village. Two Christians “not party to the altercation” were killed; others were stabbed and critically wounded. As usual, “after killing the Copts, Muslims went on a rampage, looting and burning Christian-owned homes and businesses.” Even so, “Muslims insist they have not yet avenged” the death of their co-religionist, and there are fears of “a wholesale massacre of Copts.” Many Christians have fled their homes or are in hiding. Nigeria: In the latest round of violence, soon after mosque prayers were heard, hundreds of armed Muslims invaded Christian villages, “like a swarm of bees,” killing, looting, and destroying virtually everything in sight; at the end of their four-hour rampage, some 150 people had been killed—at least 130 of them Christians. Another 45 Christians were also killed by another set of “Allahu Akbar!” shouting Muslims who burned, looted, and killed. Hundreds of people are still missing; the attacks have included the bombing of at least ten church buildings. Nearly all the Christians in the area have fled the region. Pakistan: A 25 year-old Christian was shot dead by “an unidentified gunman in what his family believes was a radical Muslim group’s targeting of a Christian.” According to the son, “We firmly believe that my father was killed because of his preaching of the Bible, because there is no other reason.” He began to receive threats “after voicing his desire to start a welfare organization for the poor Christians” of the region. Egypt: Following October’s Maspero massacre, when the military killed dozens of Christians, some run over intentionally by armored vehicles, Egypt’s military prosecutor detained 34 Christians, including teens under 16, on charges of “inciting violence, carrying arms and insulting the armed forces”; many of the detainees were not even at the scene and were just collected from the streets for “being a Christian.” Three are under 16 years of age, including one who, after having an operation to extract a bullet from his jaw, was chained to his hospital bed. 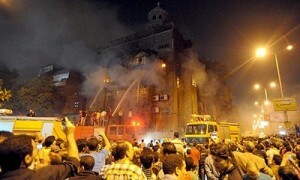 Hundreds of Christians also came under attack from Muslims throwing stones and bottles, after the Christians protested against the violence at Maspero: “Supporters of an Islamist candidate for upcoming parliamentary election joined in the attack on the Copts.” Meanwhile, a senior leader of the Salafi party, which came in second after the Muslim Brotherhood in recent elections, blamed Christians for their own massacre, calling “Allah’s curse on them.” Muslim Brotherhood leaders asserted that only “drunks, druggies, and adulterers” are against the implementation of Sharia—a clear reference to Egypt’s Christians. Previous ArticleDo You Reject Dates Based on Family Background? When is our goverment going to speak out or do something about this? Oh, sorry I forgot; they are too busy promoting the LGBT agenda around the world to worry about this. When there are more faithful and courageous Catholics stand up against corrupting political system and culture. Muhammad deserve a title of “False Prophet”.